Only $.003/email up to 500k and $.001/email above that. $2 min. How many emails to verify? Norbert wants your email to reach real people. ...and doesn’t want to see you get blacklisted. When emails are sent to invalid email addresses, they bounce. The more you bounce, the lower your sender score will drop. You'll be trapped by spam filters and eventually blacklisted. Norbert makes sure every email you send, reaches a real person. This will increase your deliverability, open rate and revenue. It’s like a washing machine for emails. Hand in your dirty list. Upload or copy-paste your list with dirty emails into Norbert's system. Sit back and grab a cup of joe while Norbert works his magic. Download your list, all clean and ready for your next email campaign. Integrate Norbert's Verify API for real-time email verification in your products, databases and processes. Available for PHP, Python, Ruby and .Net. Take a look under Norbert’s hood. Norbert removes all duplicate email addresses so you don't email people twice. Norbert filters out invalid email formats. Only the good guys get through. Norbert gets rid of all email addresses that consist of inactive, invalid or parked domains. Let's skyrocket your deliverability and keep your sender score safe. Have over a million emails to verify? Get in touch. Hello! I'm the majordome behind Voila Norbert where I identify emails and maximize lead generation for my clients. During that process, I have to verify emails one by one. This tool above is coming handy if you only want to verify your email lists in bulk! A question? I'm always around. Hmm.. so you verify emails, Norbert? I already verify thousands of emails everyday as part of my incredible email identification algorithm. Now you can tap into this specific part of the algorithm as well! What will you charge to verify my emails? I'll charge you only $.003/email up to 500k and $.001/email above that. $2 minimum charge. The more you verify, the less you pay! I can't guarantee 100%, error-free results. Email verification is very complex and depends on each specific email server that your clients are using. I spent the last couple of years trying to figure things out and I think it's working pretty well, but I can't say that it's foolproof. You have a API I can use? 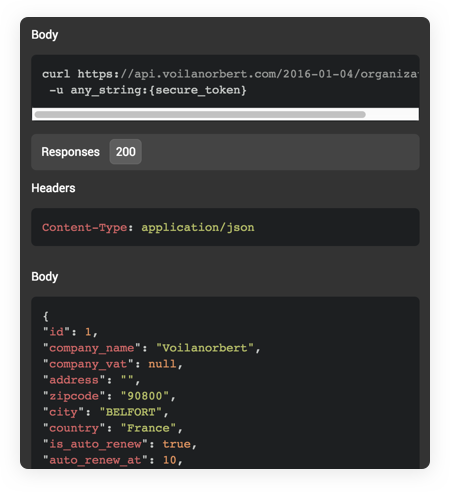 Our Verify API is fully documented and built to integrate into your work flow or site. No and no. You don't have to create an account and even less enter in some kind of agreement with me. Just submit your list of emails, I'll process them straight away and get back with an answer. Certain email providers are restricting email verification on their servers. I found some ways to minimize that and provide as much information about an email I can, but that still happen from time to time. "Risky" means that I think it's deliverable, but there is a chance of bounce. I verify if the connection to the mail server owning this email address can be established properly, if the email still exists and if it doesn't appear to be a catch-all. After that, I also have some secret sauce ingredients to ensure proper accuracy!